» Fitness » Where do I get iron if not from red meat? Where do I get iron if not from red meat? We’ve heard from a lot of you that your goal for the year of 2014, is to adopt a 100% plant based diet, part vegan, or just truly focus on including more veggies in your daily meals. We want to help. Nikki and I made a plethora of mistakes on our journey to living a plant based lifestyle and our goal is to guide and help you thrive and make things a little smoother by sharing what we have learned. 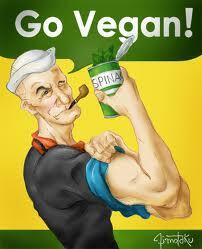 I am convinced that humans can experience vital health by following a plant based diet. With that said there are several nutrients that meat eaters get in abundance that vegans and vegetarians need to be more mindful of. With this in mind, I’d like to spend some time looking at these nutrients and how to work them into your animal free diet. Today, let’s talk about iron. 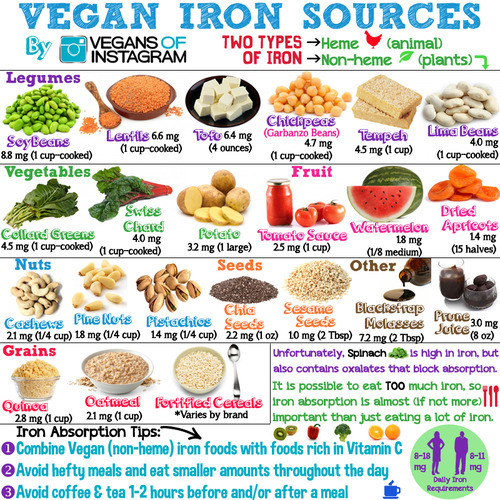 Iron is a mineral that’s an important component of two proteins, hemoglobin and myoglobin. Hemoglobin, found in red blood cells, carries oxygen to your body’s tissues. The lesser-known myoglobin also helps provide oxygen to muscles. The adult body tends to hold onto iron, so we don’t need much of it. The RDA is 18 mg. The exception to this is menstruation. Since the bulk of your iron is stored in red blood cells, women with heavy periods experience significant iron loss, about 30-45mg a month, so they typically want to eat a little more iron during these times. There are two kinds of dietary iron: heme and nonheme. The body absorbs heme, which comes from meat, better than nonheme, which comes from vegetable sources. Fortunately, there’s an easy trick to increasing nonheme iron absorbency: consume it with vitamin C. Conversely, try to avoid tea with your iron sources because the tannins can inhibit absorption. Primarily, I’d say beans and lentils – black beans, chickpeas, pinto beans, kidney beans, you name it. Soybeans are particularly high in iron, but they also contain amino acids that inhibit its absorption. However, if you ferment the beans, the bioavailability goes up, so if you’re feeling soyish, look to tempeh, miso, and natto. Kale and mushrooms can also be good sources of iron, as can whole-wheat flour, oats, rye flour, and everyone’s favorite quinoa. Although people often associate spinach with iron, it’s actually not a great choice because it contains oxalic acid, which limits iron absorption. Nowadays many people take Nutritional Suppliments to improve health, for more info see this page. I hope you found this information helpful. Next article will dedicate to vitamin B12 .